How to Add a Twitter Feeds Widget in Blogger? Twitter is among the most powerful and highly dominating social networking portal on earth. At MyBloggerLab, we actively use our twitter profile for interaction, helping users to solve their Blogger related problems and does a lot discussion. 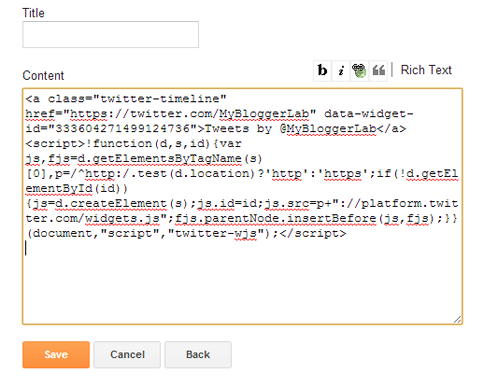 Recently, we got a lot of requests from our users asking for a way that How they can add Twitter Feeds in Blogger. Luckily, Twitter itself offers a built-in widget which you can easily be added in your blogger site. In this article, we will show you How to Add Twitter Feeds Widget in Blogger? The first thing you need to do is to access the Twitter Widget page. If you are already signed in to your account, then it will show you the exact preview of the widget on your profile. There are plenty of options for customization you can adjust the size, shape, color and theme of the widget. By default, the widget automatically takes shape and adjusts its widget, so you are always in the safe hands. Once everything is done press ‘Create Widget” button and move to the next step. Congratulations: Now you will see the widget on your site. 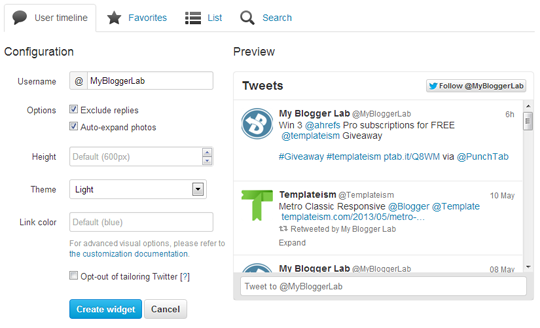 If it does not catch any errors, then congrats the twitter feed widget is successfully added to your Blogger sidebar. However, you can also add this gadget in any part of your site, go to Post editor and give it a try. This is not it because Twitter also offers 3 different types of Gadgets including timeline of your favorite tweets, Hashtag and search keyword. If you want to add them, then they are pretty much the same. The perks of using Twitter recent tweets widget is not limited to just displaying the latest tweets. It also displays a follow button that allows your visitors to follow your account with just a single click. Additionally, it also allows your visitors to mention you in a tweet directly from your site. We hope this small but usefully widget would help you in attaining some sorts of social exposure. If you have any question or query related to Twitter then, do not hesitate to leave a comment below we will try to guide you through your problems. Where is this code??? it not Catching anyway??? On pressing "Create Widget" you will get the Code. Sorry for the off-topic comment, but Dear Syed someone is stealing my content from my website and publishing on his blogspot.com blog,this is an alarming situation for me.I have reported them to http://www.google.com/support/bin/request.py?contact_type=lr_dmca&product=blogger but google has not responded me after 48 hours.Tell me what should i do? I am very worried about it. Adeel if someone is copying your content then you should complain to Google DMCA. Blogger support forum would not help you in any content violation. You have to counter a DMCA complain against the website. We have written a detail tutorial over it. Please take some time to have a look over it. But the problem is that,i am running my website on a self hosted Wordpress.What should i do now? If the content which you own is located on a Blogger site even then you can use Blogger Dmca. Yes. Faizan is right. Give complete and genuine details and leave rest on Google! Nice article anyways! i am not using Blogger and my data is not located on blogger.However the violater keeps my data on blogger site.What should I do now? I'm not seeing my Twitter feed after completing this process. All I get is a hyperlink that takes me to my Twitter page. I want people to see my feed directly on my blog without having to click through. This would work too for non-Blogger Platforms! Well, that is what Twitter is Offering at the moment. wow!!! thank you a million!!! you guys are the bestest! Well, Are you following the steps correctly. Let me know where exactly you are getting the bug? This would be very helpful, as frame is too small to support full blog page. Please, please please...can the author respond to this? my twitter widget not working. It shows only a link with @ . This was a helpful article but the authors could have gone a step further and explained where the Gadget was located. From the looks of the comments above, that gadget was easily overlooked. I know I didn't see it on the first try! Hope this helped. Thank you for your helpful instructions! This article really helped me, but now it isn't working.. I'm using a template, on the classic templates. Does it also work there, or do I have to go back to the new types of templates? It Works fine on all templates either classic or new. I'm using the Twitter widget but no preview is being shown. When I copy/paste the code into Blogger's gadget, nothing happens. Any ideas? I did the same thing. I just saw a blog with that feature, searched in Google how to do that and got this link. In five minutes I did it for my blog too. Thank you. Sharing this is very noble and allow a lot of people to improve their sites.